A horrific story came to light in the equestrian news recently when a prized show horse was killed instantly by a truck on a main road in England. 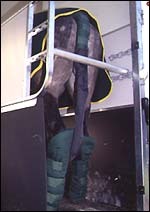 The horse was being transported in a trailer when the pins that hold the ramp shut popped out and the ramp fell open. This was a very popular make of trailer and was not very old. If anyone has had a similar experience of anything like this happening to them please contact PC827 Kate Hardt at Rugby Police Station on 0300 1234455 who is investigating this case. If you are considering buying a horse trailer soon you may want to take a look at this very informative web article published by the RAC. If we are to expect our trusting equines to walk into a box on wheels, the least we can do is ensure it is safe and road-worthy. A lot of these checks also apply when buying a horse lorry. Once you have bought, hired or borrowed your trailer there are some essential checks to make before you head off onto the open road. The National Trailer and Towing Association have published a list of things to do and what to check for each time you venture out with a trailer-you may need a second person to help you check the lights and indicators are working correctly. Obviously your equine will be suitably attired to travel with whatever protective wear is necessary (and he is happy wearing!). DO NOT tie your equine or the haynet directly to a tie ring in the trailer or horsebox. Use some twine or safety strap that will break if he becomes caught up. Remember you have a live animal on board that can easily lose its balance!